Whether you removed your nose ring for a job interview, a cleaning or just to change it up, it can sometimes be difficult to get the jewelry back in place. These are some simple steps you can take to make the process a bit easier. Clean the piercing thoroughly using a gentle cleaning solution. You can find one designed for nose piercings at your local piercing shop or online. Place the tip of your thumb inside your nose. Press the tip of your thumb against the interior hole of your nose piercing. This pressure will serve to widen the hole slightly. Insert the pointed end of your nose ring into the outer hole of your piercing. Twist the nose ring from side to side. Continue to do this as you move it into the hole. Remove your thumb from the interior hole once you feel the nose ring pushing through. Push the nose ring all the way through the hole and into its place. If you are experiencing difficulty, try putting a small dab of Vaseline on the nose ring to lubricate the process. If you have a nose screw, turn the screw clockwise into the hole. 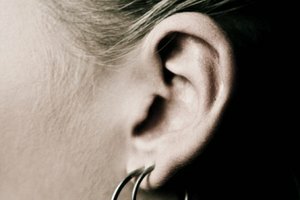 There are some nose screws that require counter-clockwise turns, but most turn clockwise. 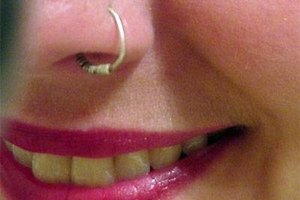 Don't remove your nose ring for six to eight weeks after your initial piercing.